Hello lovelies! It is time for yet another product review, and we’re on to something a bit…. different. I’m just joking! But we are actually going to be talking about feet this time around. It’s summer time and at least for me, I’m spending a lot of time barefeet or in sandal shoes which do a poor job of concealing my feet. In other words: I want them to look their best! So, my favourite remedy for tired looking, rough skinned feet? A nice foot mask. 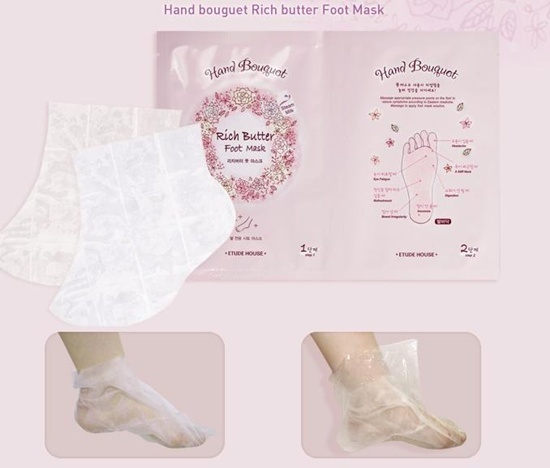 Etude House’s Rich Butter Foot Mask is a part of a mask series from hand masks to elbow masks and, of course, feet masks. The mask is designed to provide moisture and relief to tired and rough feet. It helps soften the skin and the cooling sensation is truly wonderful after a full day on your feet, especially in this heat. The mask is not peeling, so if you have problems with especially rough patches of skin under your feet, I suggest starting out with one that peels off old skin, and then proceed to use a moisturising mask a few times a month to keep your soft baby feet – but to most people this Rich Butter mask should do wonders after a few treatments. The first time I tried this mask, I had been out shopping and sightseeing in Seoul for a full day, wearing heels and my feet were truly killing me. The mask was a blessing from above, purchased on a whim earlier in the day, and heavenly cooling and relaxing. I would recommend this to anyone who wants to spoil their feet an little extra every now and then. It comes with a lovely manual explaining different pressure point on the feet, so that you’ll be able to give yourself a nice little massage while treating them. Next Article Rain snaps a photo with English actor Hugh Grant!